Barry K. Schwartz is an American businessman and Thoroughbred racehorse owner and breeder. 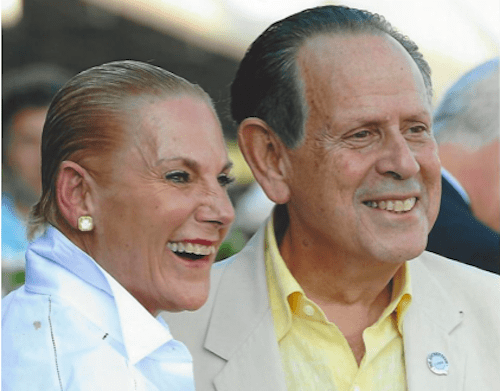 He and his wife Sheryl share a love of the horse and thoroughbred racing. In 1968 Schwartz partnered with his childhood friend and fashion designer Calvin Klein to establish the clothing brand, Calvin Klein Inc. He became the Chairman and CEO of Calvin Klein Inc. and the two built the business into a multibillion dollar operation and one of the most successful and recognizable brands in the industry. Schwartz has been a fan of Thoroughbred racing since his childhood in New York. He purchased his first horse in 1978. He is a successful owner/breeder and many of his top runners come from his 700-acre Stonewall Farm in Granite Springs, NY. He served as Chairman of the Board of Trustees and CEO for NYRA from 2000-'04. He was awarded The Alfred G. Vanderbilt Award as “the person who did the most for racing” in 2001 by the NY Turf Writers' Association. He is a member of The Jockey Club. Schwartz is widely recognized as a friend not only to horsemen and breeders, but to those who come to the races and back their opinions at the windows. He has always been courageous in his approach to racing and is a leader. “Sheryl and I would like very much to join WHOA. We have been in racing for more than 40 years now and never in that time has the need been greater for a regulatory bill to be put into effect. The general public is as skeptical as ever about drugs being used in racing and in many cases they are correct. The Water Hay Oats Alliance (WHOA) is a grassroots movement of like-minded individuals who support the passage of federal legislation to prohibit the use of performance-enhancing drugs in the sport of horse racing. The appointment of an independent anti-doping program run by the U.S. Anti-Doping Agency (USADA) will resolve the problem of widespread drug use in American racing and put U.S. racing jurisdictions in step with international standards. This entry was posted in The Biz and tagged barry schwartz, calvin klein, New York Racing Association, sheryl schwartz, stonewall farm, u.s. anti-doping agency, usada, Water Hay Oats Alliance, WHOA by Water Hay Oats Alliance. Bookmark the permalink.